This simple powershell script will create a package in SCCM2012 with a single standard program, and distribute it to your DP Group. It uses the ConfigMgr native commands, and you can add/remove/change the parameters to customise the script for your own environment. Using SCCM standalone media can be a good way to deploy an OS when you have, for example, remote offices with no local distribution point. However, if you use DVD media it can result in several DVDs if you include all the applications and drivers. So I prefer to install the drivers and applications separately after deployment and keep the OS install on one or two DVDs. As we use Dell computers, it’s quite easy to get hold of the driver pack from the Dell website, which you can then install using PnPUnattend. To speed up the process, I wrote a simple batch script that will download the relevant driver pack from Dell and install it. This process can also be used for non-Dell models, you simply download the drivers you need, extract them, place them in the C:\Drivers folder, add the registry key, and run the PnPUnattend command. Note: You need to have at least a NIC driver installed before running the script, so you can connect to the internet. set /p choice=Which Model do you wish to install Drivers for? echo !! "%choice%" is not a valid choice! Please try again"! REG ADD "HKLM\SOFTWARE\Microsoft\Windows NT\CurrentVersion\UnattendSettings\PnPUnattend\DriverPaths\1" /v Path /t REG_SZ /d "C:\Drivers"
What happens if your SCCM task sequence fails? Well you troubleshoot it, fix the problem, and rerun it. 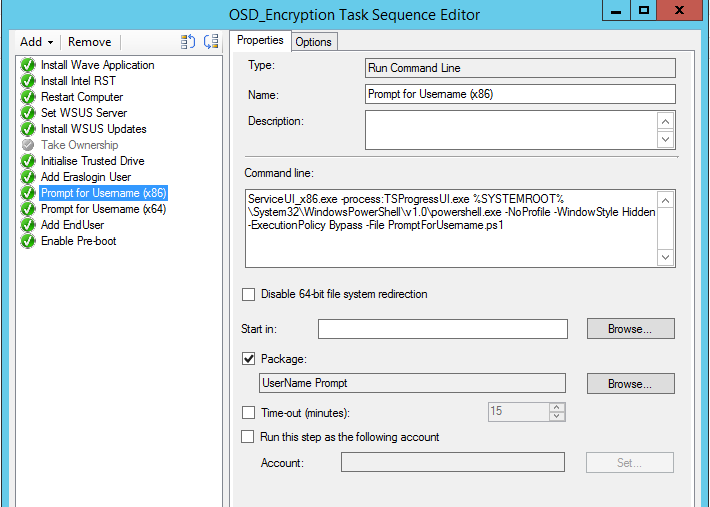 Easy to do if the task sequence is an ‘available’ deployment. You just refresh the machine policy on the computer, go the Software Center, or Run Advertised Programs, and run it again. 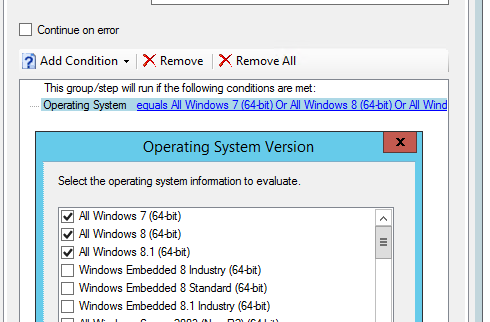 And if your task sequence rerun behaviour is set to ‘Rerun if failed previous attempt’ it will run again anyway. But what if it’s a required deployment? There seems to be no easy ‘out-of-the-box’ way to manually rerun a task sequence. Powershell to the rescue! This little script will rerun the task sequence by connecting to the remote machine, deleting the TS schedule from WMI, and restarting the SMS Agent Host service. After a few seconds, the TS will run again. You need the Task Sequence Package ID, which you can get easily from the SCCM Console, and you should have Powershell remoting configured in your environment. You can of course run the script on a local machine by removing the ‘PSSession’ commands. This script reruns a task sequence on a remote computer. With our SCCM OS deployments, I like to install some of the ‘driver apps’ that come with our Dell machines, such as the Intel Management Engine Components (AMT), Bluetooth, and Rapid Storage Technology. But for a long time the Rapid Storage Technology always bugged me because I couldn’t install it during a task sequence, either during deployment or after. It would give some ‘fatal error during installation’ message that wasn’t very helpful. Since it wasn’t critical to include it, I didn’t investigate too much further, but with the new Dell 7000 series laptops, it’s a requirement to install the Intel RST version 12.8 in order for the encryption software we use to work. So I decided to dig around a bit to get this working. I used the ServiceUI tool from MDT to create an interactive installation during a task sequence, and then I discovered it was trying to log to a folder in the user profile area, which it couldn’t do for some reason, even though it could when installing outside of a task sequence. It turns out there is a simple fix, and I can’t believe I didn’t think of it earlier! 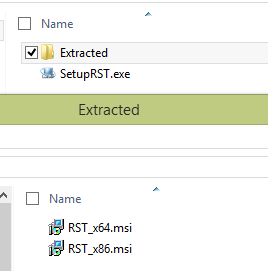 I extracted the SetupRST.exe file using 7Zip, and inside were 2 msi files, one each for x86 and x64. These can be deployed successfully during a task sequence using the standard unattended program that SCCM creates for MSI packages.